Hermits Cove and Buffalo Bluff are on the eastern shore of the paddling trail. The Stokes Landing community is located on the western shore. 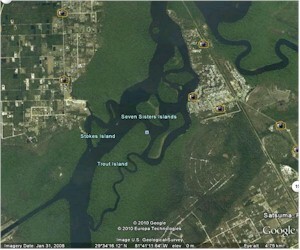 The St. Johns River Club is just around the bend half a mile north of the railroad trestle. The St. Johns Ship Building facility is located on the western shore. The Marjorie Harris Carr Cross Florida Greenway trailhead is a 1.75-mile paddle from the area. 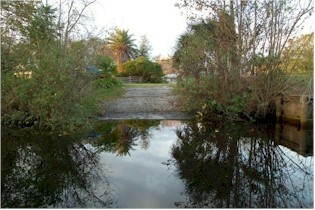 The only public access to the area is a small boat ramp in the Hermits Cove community. Nearby, the Hermits Cove Marina has docks, parking, food and beverages. Simply ask before you launch. Parking is nearby. The paddling trail is 3.25 miles from the Browns Landing boat ramp. There are two private landings in the Buffalo Bluff community, and details will be on the website. There are no public landings in the Stokes Landing area. This area is a beautiful paddling area with the many islands and wildlife species. The trail averages over 100 yards wide and the river is narrow. Caution should be used when crossing the river channel due to motorized traffic. Plan your paddle before you cast off since you will be returning to your launch site and there are several creeks and islands in the trail.